Every Child Matters. Every Gift Matters. When you make a gift to Children's of Alabama, through our secure website, you are giving to the highest priority needs of the Hospital. Thank you for supporting Children's of Alabama. Each year, Family Friends support is essential for patient programs and services that make Children’s a special place of hope and healing for our young patients. 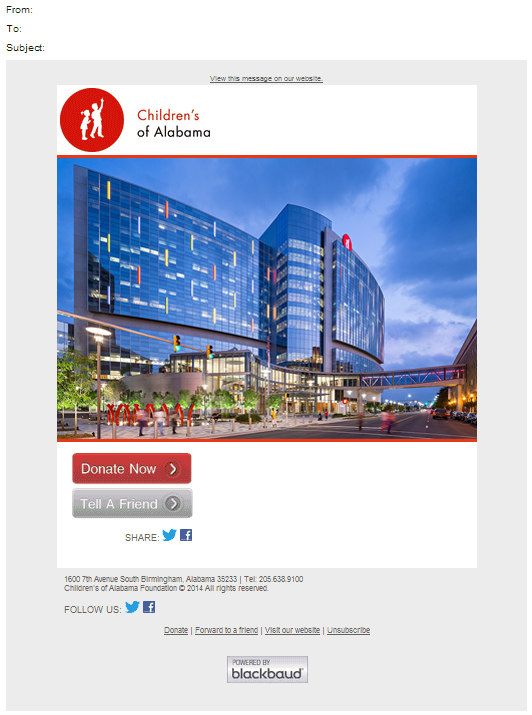 As a Family Friend of Children’s of Alabama, you will receive Connections, a quarterly newsletter, highlighting patient stories and hospital progress made possible because of your support. Family Friends are also recognized on our website, on electronic signage in the hospital and in our digital annual report. • Parents and families grieving the death of a child. • Children, teenagers, young adults (19-21), and their caregivers grieving the death of someone in their life. Families attending The Amelia Center find support, understanding, and comfort that they are not walking the path alone. Additionally, The Amelia Center serves as a community resource for consultation and training to schools, churches, and area organizations in the area of grief support. Your support helps us provide the very best care for children and find cures that will save lives worldwide. $50 could provide the Hospital with bubbles, books games and other tools to help distract a child during a medical procedure or could provide the “Beads of Courage” journey for two patients..
$100 could provide a set of plastic ear molds for hearing aids for one a patient or Arts and Crafts supplies for a group of patients. $250 could provide Physical Therapy and Occupational Therapy technology and equipment for patients or one I-pad used to distract patients going into surgery. An Annual Gift of $500 - $999 is recognized as part of our Red Crayon Society which includes in-hospital recognition, on our website and in our annual report. An Annual Gift of 1,000-$1,999 is recognized as part of our Red Wagon Society which includes in-hospital recognition, on our website and in our annual report. An Annual Gift of $2,000 or greater is recognized as part of our Red Circle Society which includes in-hospital recognition, on our website and in our annual report. By donating to Children's Hospital, you are supporting world-renowned care and research by a team of premier physicians, scientists, nurses and staff. Please enter a designation for your gift. If no designation is chosen, your donation will go to the area of greatest need. I would like to receive e-communications from The Children's of Alabama Foundation. I would like my gift to remain anonymous in all Foundation publications.